Its simply impossible to single out anyone from the hordes of fans and devotees that the legendary artist Dr Bhupen Hazarika has accumulated both knowingly and unknowingly in his lifetime. One such fan, an unwavering devotee, is the well-known eye specialist Dr Hiren Saikia. Besides being a successful physician, Dr Saikia is a poet and social activist. He has made quite an impact with his works as a social activist in his locality, but his most notable achievement has been the acquisition of Assam’s only the second printing machine – ‘Dharmaprakash Jantra’, which is installed at the ShriShri Auniati Satra in Teok, Jorhat, under his initiative. Dr Hiren Saikia has also made a name as a publisher with several books to his credit. He has made a priceless contribution to literature with the publishing of Deben Tasa’s translation of Madhavdev’s ‘Naam Ghosa’ in the tea tribe language. Dr Saikia, who fiercely prides himself in Assamese culture and heritage, recorded quite a few of Dr Bhupen Hazarika’s musical shows held in various parts of the State with an ordinary yet reliable tape recorder as a student. Like countless other fans and admirers of the music maestro, the young Saikia was obsessed with the Sudhakantha’s uniquely deep baritone voice and his evergreen compositions with their incredibly rich and powerful lyrics. Imbued with an unshakable will and an insatiable infatuation, Dr Saikia toured and recorded the Bard’s programmes with the magnetic tape recorder, despite the occasional hindrance in some of the venues. Dr Saikia’s tireless efforts have resulted in the compilation of three of Dr Hazarika’s rare musical conferences that he had carefully preserved for the last four decades. These invaluable recordings took place in Silchar (1976), Jorhat (1979) and Dibrugarh (1983). 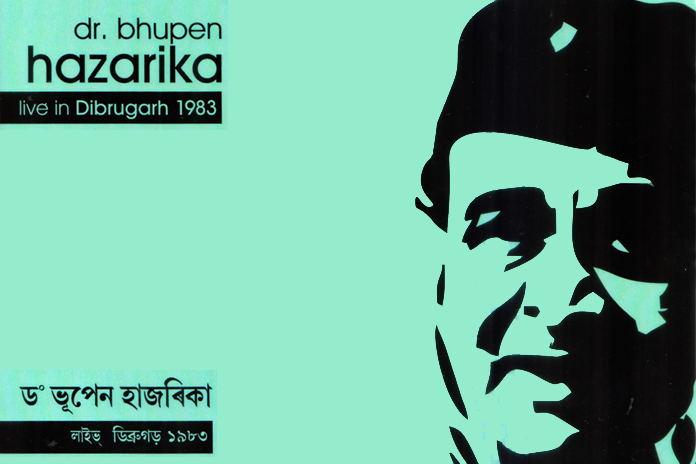 Dr Saikia took a step further to make three audio CDs out of these recordings with the names – Dr Bhupen Hazarika Live in Silchar 1976, Dr Bhupen Hazarika Live in Jorhat 1979 and Dr Bhupen Hazarika Live in Dibrugarh 1983. Besides the wonderful songs, Dr Hazarika breaks into witty anecdotes from time to time, eliciting thunderous claps and approvals from the adoring crowds. These three compilations were arranged and devised under the dexterous supervision of noted music director Bhupen Uzir at the Auditek Studio. It was Uzir, who suggested the idea of converting and digitising those outmoded tape recordings after Dr Saikia came to his studio. He has already transferred quite a number of such old cassette tapes and discs to the digital realm. A lot of time and effort went into polishing and repairing those early recordings, which were diligently mastered, using modern technologies. Its utterly amazing to hear those riveting classics in Dr Hazarika’s awesome voice from a different time and period. 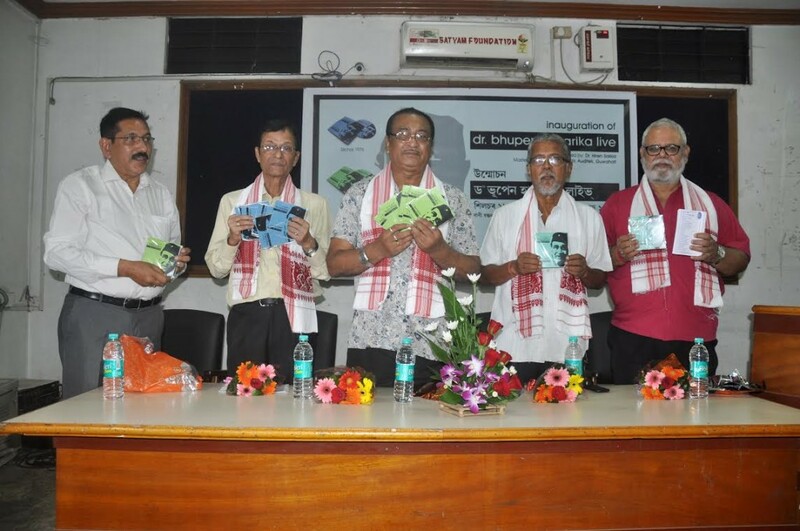 Recently, this highly treasured and rare volume of songs packed together in three CDs was released by eminent musical artistes – Samar Hazarika, Bhupen Uzir, JP Das and Surya Goswami, at the Guwahati Press Club. Samar Hazarika during his speech lamented the disappearance of all the prints of movies made by Dr Bhupen Hazarika. Everyone heaped praises on the efforts of Dr Hiren Saikia, and at the same time, urged people to hand over any such old recordings to Bhupen Uzir for digitisation. The function was also graced by Beauty Sarma Barua, Malabika Bora, Meera Das Saharia, Pahari Das, Kanika Bhattacharya, Namita Bhattacharya, Bhaben Saikia, Shanta Uzir among others.